A memorial in front of the Drexel home where a woman and her three sons were found dead Saturday. CHATHAM — On Saturday, the Chicago Police Department needed breathing equipment when they entered the home of a Chatham family that was found dead. The stench from the home was so overwhelming that neighbors had called police, who needed a special apparatus from the Fire Department to get in. What officers found inside was even worse than the smell: a 28-year-old woman and her three young boys dead and decomposed — and evidence of a fire that may have been intentionally set. Latoya Jackson, 28, was identified as the woman found dead in the 8300 block of South Drexel Avenue, officials and family members said. 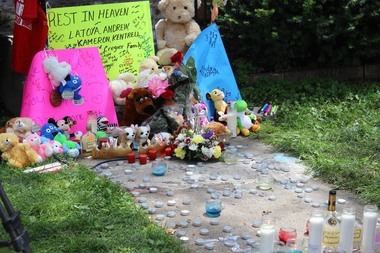 Her children Andrew, 11; Cameron, 9; and Cantrell, 5 were also dead in the residence. Autopsies on the family were inconclusive, according to the Cook County Medical Examiner's Office. Police said they had no information on what happened there, citing an "ongoing investigation." April Bussell, 30, was camped out Monday afternoon in front of the Drexel Avenue home. She had been friends with Latoya Jackson since she was 14. “I just feel like this is where I’m supposed to be,” Bussell said. Bussell described her close relationship with Jackson, and said neighborhood tensions pitted them against each other at first. They fought, but were later attached at the hip, she said. “I ended up taking her under my wing,” the heartbroken friend said. She said her best friend was a good mother, who often took her boys to the park and the beach. She loved to grill, Bussell said. The federal Bureau of Alcohol, Tobacco, Firearms and Explosives was on the scene Monday investigating the remnants of a fire in the home, but ATF spokesman Thomas Ahern said the cause or origin of the fire was unknown. "There was an indication of fire inside, but no one reported the fire," Chicago Fire Department spokesman Larry Langford said. Langford said firefighters initially responded to the scene to bring officers breathing equipment and to enter the residence, but police and ATF officials took over the investigation from there. Though officials have not categorized the deaths as murders, community members are deeply suspicious. Bussell said Jackson had a boyfriend of a year and a half. A concerned neighbor said “I don’t think what happened there has anything to do with the neighborhood. To me, when things happen like that, it’s based on a relationship the person probably has, but it’s not random." The neighbor described the dead woman as “always polite." "Her boys were always polite. I would see them in the yard playing," the neighbor added. Ald. Michelle Harris (8th) was shaken that something like this happened in her ward, and said she was communicating with the Police and Fire departments. “To think someone would kill three kids, it’s horrible, it’s unimaginable,” she said. “I am deeply saddened and appalled that anyone could feel that it’s OK to do this. It’s unfathomable to think anyone could have such little regard to the lives of children and a woman." Police initially responded to the home on Drexel around 8:25 p.m. Saturday. When asked about the last time Jackson was seen, the neighbor said Memorial Day, but officials have no information on how long the bodies were in the home. As for evidence of a fire in the residence, officials offered few details. “They haven’t come up with any conclusive findings, so we don’t know the origin or cause of the fire,” the ATF's Ahern said. Gloria Lofton, Jackson’s grandmother, said being around her church family has given her strength. “My heart is just a little heavy right now about what happened to my great-grand kids and my granddaughter. It’s horrible,” she said. Lofton said that the family was still working on funeral arrangements. Wooten urged anyone with information on what happened to the family to come forward, and he hoped his organization could get Chicagoans to pay more attention to neighbors who might be in trouble.